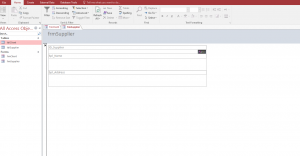 In this article we will explain how to build a simple back and forth menu using Microsoft Access and its forms. 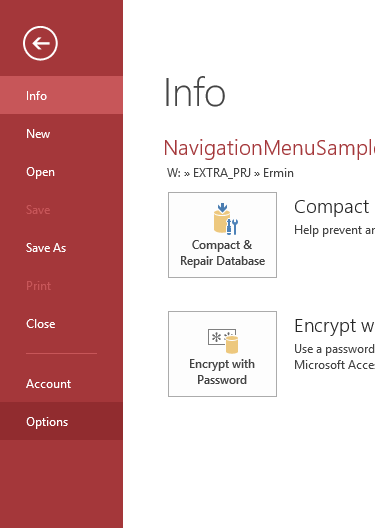 A proper navigation menu is essential to any desktop software solution. The final users should have a central point they can use to direct themselves to the required working window. 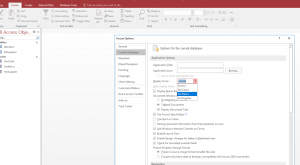 There are several possible approaches, using the Microsoft Office Ribbon, or if developing using Visual Studio, creating a proper MDI rich desktop solution. 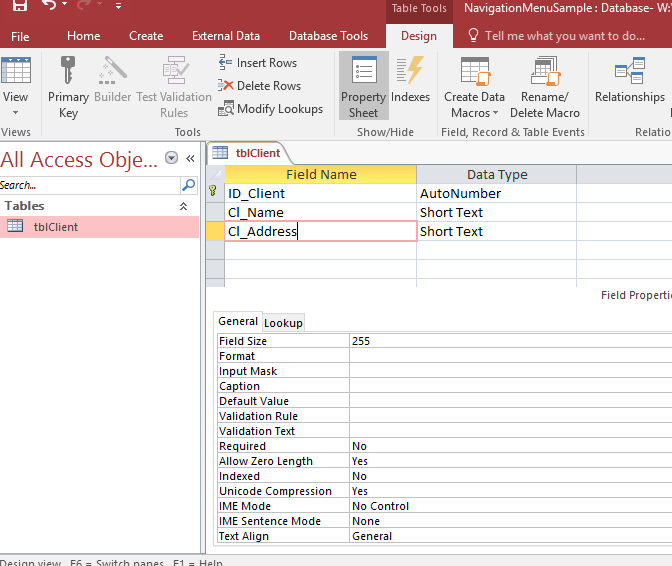 Being able to utilize VBA programming is essential. We will present a set of forms that will interact with each other and a main menu form to call their opening event. 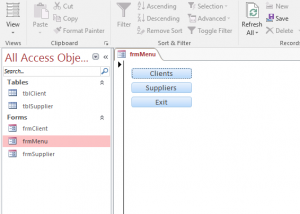 We will go step by step and show you how to create an access vba custom menu. As a side note, please pay attention to the naming convention, all use the suffix frm and tbl. Naming conventions are important when developing with any programming language. There is no dogma here, just define one and use it along all the development. If you lack imagination just google for examples. 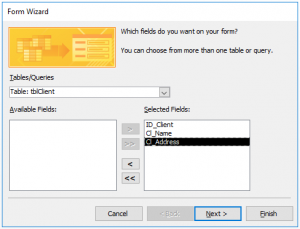 These three forms will require two tables so we can have form controls bounded to data. 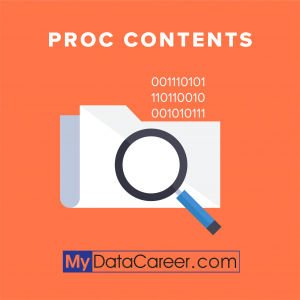 We are assuming readers already have a basic Microsoft Access knowledge. The example tables could be similar to the ones presented in the next images (not much fields are required for this sample tutorial we present just some basic ones). 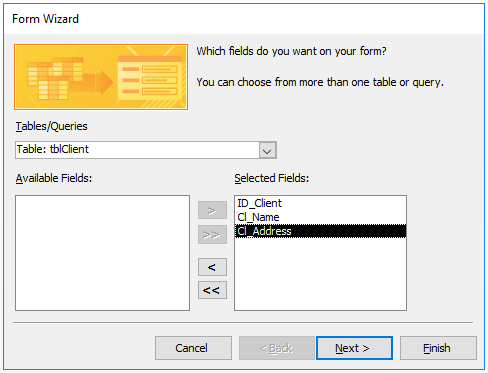 After that the user should select the required table (in this example tblClient) and press the next button. After that select the justified layout. Press the next button, change form prefix to frm and hit finish. The desired user form will be presented with Microsoft Access defaults. The reader should repeat the previous steps and create a second form to manage Suppliers’ data. The final form layout should be similar to the one presented below. Each one of the previous forms will have its own back button so the user will be able to navigate to the main distribution menu window. 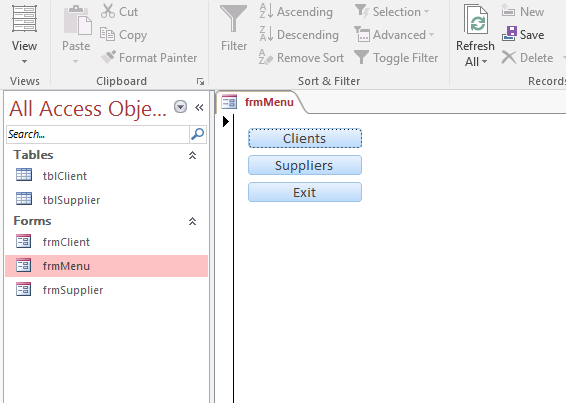 The whole point is after-all to create a main access vba custom menu to organize our database. academic tutorial any position is fine but if the reader is looking for professional looking layouts, positioning, standard sizing, naming and layouts are very important details to consider. Once the button wizard initiates hit the cancel button. From this point onwards the properties will be defined manually. Regarding the created button please define its properties as follows. First set the button control name to cmdBack. The reader is invited to execute the similar sequence to the Suppliers form. 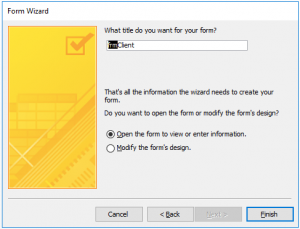 The steps are: put the form in design mode, select a button control, click on the form’s header to position it, cancel the wizard and manually set the Name and Caption properties accordingly. Later on, the proper button click events will be properly handled. 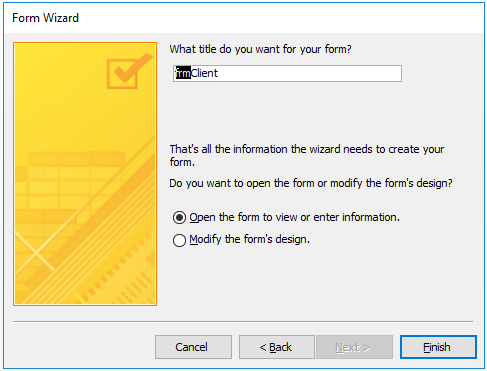 When adding each button cancel the button wizard and manually set the buttons’ name and caption properties. You should have a button called cmdClient with caption Clients, a button called cmdSupplier with a caption Suppliers and a button called cmdExit with a caption Exit. In the next steps we will be handling the required events for the created buttons and forms. We will start by the frmMenu form. The logic will be: when the user clicks the Clients button the actual frmMenu form will hide and the clients’ window will be shown. A similar logic will apply to the Suppliers’ window. This means no two windows will be visible at same time, to navigate from Suppliers to Clients the user must pass through the main menu window. Let’s define the on click event for the Clients button. 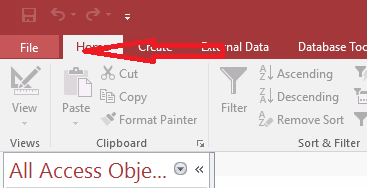 The reader should press the three dots on the event area and access the Visual Basic editor after selecting the option code editor from the prompted window. 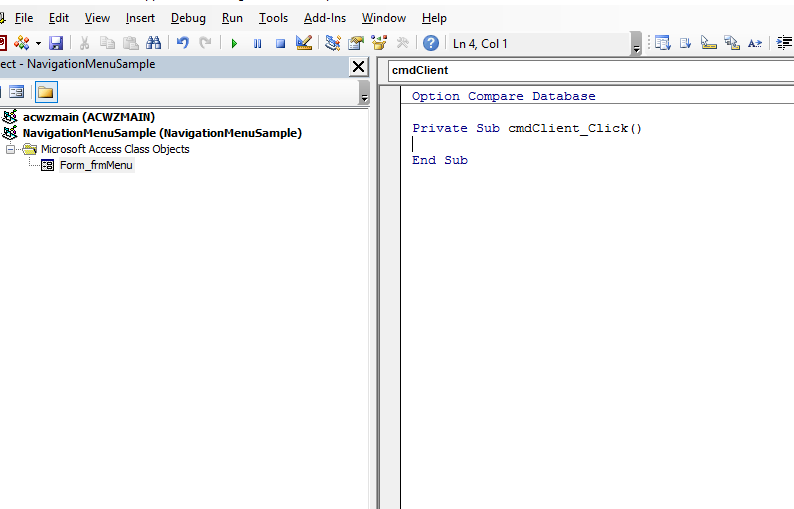 For the on click event related to the cmdCLient button the following VBA code must be inserted. Pay attention to the presented error handler. This tutorial will not get in detail regarding them but it is a good programming practice to handle errors properly. This applies to any programming language. The code sequence is simply: hide the menu form and open the Clients form. This on click event will close the opened Clients’ window and will show the Menu form again. 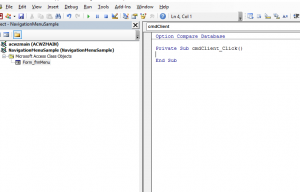 The code is almost the same one should only change the form name and the method name. The underlying logic is exactly the same and is easily extended to more forms. 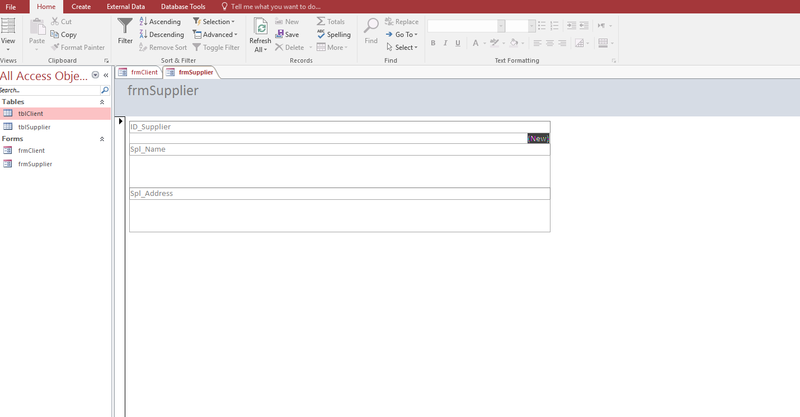 To test the window workflow the reader should close all forms and open the menu form. 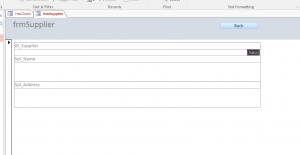 Clicking on the Clients button will close the open menu form and will show the Clients’ window. Pressing the back button will close the Clients’ window and will take the user to the main menu window again. Hitting the Suppliers button will work on a similar manner but it will open the Suppliers window. To finalize the navigation logic we will handle the main menu Exit button on click event. 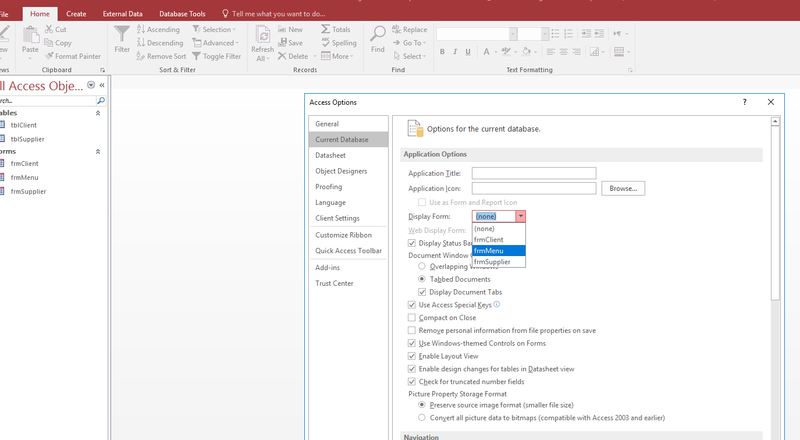 This button will allow the user to quit the desktop Access database solution prompting the user if the application should really be terminated or not. The code presented above will ask the user if the application should indeed be closed. 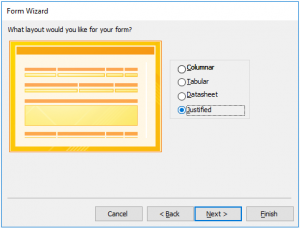 The sample use the MsgBox VBA native method that allows a large combination of configurations and layouts depending on the passed parameters. Once the main menu form does not have controls bounded to any table it does not make sense to have the records selector active. To disable it just put the Menu form in design mode and change the property Record Selectors to No, this way the left arrow in the menu form will not appear. 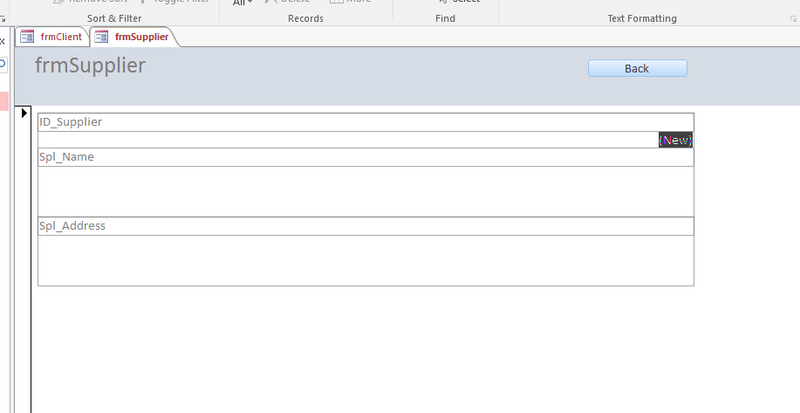 In the Current Database entry, select as Display Form the frmMenu form and it will start when the application opens. 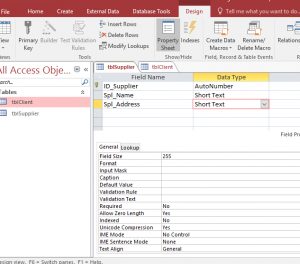 We hope this tutorial helps the readers understanding Microsoft Access as this is just a very small sample of its capabilities. 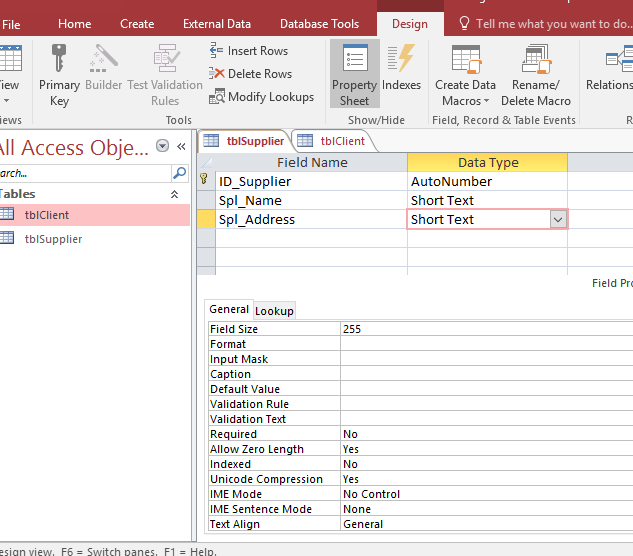 We have now created an access vba custom menu that we can be proud of! 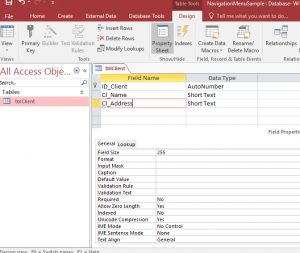 Microsoft Access is able to produce truly professional looking software solutions.